A study by scientists at the University of Southampton has revealed new clues to why people who carry the Alzheimer’s risk gene APOE4 may be more likely to develop the disease. The findings, which link the risk gene to clearance of the hallmark Alzheimer’s protein amyloid, take scientists a step further towards understanding the devastating disease. The research, published on 25 July in the journal PLoS ONE, was funded by Alzheimer’s Research UK, the UK’s leading dementia research charity. The APOE gene is the biggest known genetic risk factor for late-onset Alzheimer’s disease. People who carry the APOE4 version of the gene have a higher risk of developing the disease at an earlier age than people who carry APOE3 or APOE2. However, the reason for this increased risk has remained unclear. One of the key features of Alzheimer’s disease is the build-up of a toxic protein called amyloid in the brain. Higher levels of amyloid have been reported in blood vessels in the brains of people with APOE4, causing a condition called cerebral amyloid angiopathy (CAA). It is thought that CAA may contribute to Alzheimer’s and the Southampton team, who specialise in studying blood vessels in the brain, set out to investigate this link further. To examine the effect of the risk gene in the brain, the scientists used normal mice and mice bred to have human versions of either APOE4 or its neutral equivalent APOE3. They looked at the levels of amyloid in the blood vessels of these mice using a fluorescently labelled version of the protein that they could track. 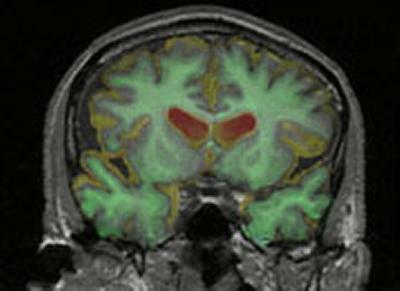 Dr Cheryl Hawkes, from the University of Southampton, an author on the study, says: “We found that only the mice with APOE4 had high levels of amyloid in the blood vessels of their brain, suggesting that people with the risk gene may not be able to clear the toxic protein as effectively from their brain. After delving a little deeper, we discovered that the blood vessels in mice with APOE4 were very different – they were made up of a different set of components that may not work as well to clear amyloid. Dr Simon Ridley, Head of Research at Alzheimer’s Research, said: “Our understanding of the factors that make up a person’s risk of Alzheimer’s is improving at an incredible rate. Across our lifestyle and the environment, our age, diet and our genes, the answers to what predisposes us to Alzheimer’s are being found. Research like this makes the risk picture more complete, and moves us closer to developing new treatments and preventions that can avert this devastating disease.